Role: Volunteers work on achieving the goals set out in the Care Management Plan, including running educational games and group activities, providing emotional support, and helping improve the quality of life for those living with disabilities. Volunteering on a Care project in Fiji is an ideal way to get involved with the local community of this fascinating island. Whether you are on a gap year, summer placement, or career break we will arrange a great project for you. Volunteers with specific qualifications and experience are welcome, though you don’t need either to join us as a Care volunteer. All we ask is that you bring energy, passion, and commitment to the placement. You can read more detailed information about the aims of the project in our Fiji Care Management Plan. The Fijian islands in the South Pacific are home to a courteous, sincere people with ancient traditions. However, Fiji is facing increased poverty as more people move from villages to city centres. Our Care placements are based in and around Nadi and Lautoka on the west coast of Viti Levu. Most volunteers work at kindergartens, though there is also an opportunity to volunteer at a centre for children with special needs. Please let us know if you have a preference on your application so we can place you according to your skills and interest. The class sizes are large at the kindergartens so it’s difficult for local staff to give each child as much attention as they need. Volunteers working here will be able to provide a helping hand by looking after and caring for the children. It is also the perfect opportunity to put any skills and interests you have to use, whether you make arts and crafts, or teach games and songs to the children - your suggestions will be well received. By showing initiative and enthusiasm the options are endless. Projects Abroad also works with a centre for children with special needs. Here volunteers can provide the children with the extra care and attention they need. This project is challenging yet extremely rewarding. There is a great need for people who have experience or qualifications in this field, in particular speech therapy or special needs education. Most importantly they welcome any volunteers who have patience and a strong desire to help wherever necessary. Volunteers normally live with a host family that is either walking distance or a short bus ride from their project. In whichever Care project in Fiji you find yourself, you need to be ready for a challenge. It is in your role as a volunteer - spending time with the children, playing with them and putting a smile on their face - that you will learn how your help impacts those you work with. Whether you’re helping with homework, playing a game, or reading a story to the younger ones, you will be an essential part of the children’s development. The majority of care centres and kindergartens in Fiji have a vacation period from the beginning of December to the end of January. 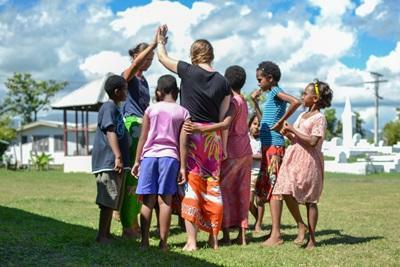 Care volunteers working during this period will continue working at the Projects Abroad summer school that is run in or around Nadi.. Projects Abroad volunteers are solely responsible for planning and running all the lessons and it’s a great opportunity to use your imagination and come up with educational lessons, games, arts and crafts, and other activities. This project is available for less than a month if you don't have time to join us for a month or more. This project has been selected by our local colleagues as being suitable for shorter durations for both the host community and the volunteer. Although you will gain valuable cultural insight and work intensely within the local community please be aware that you may not be able to make the same impact as someone participating for a longer period. If you are only able to join us for one week, please note that you will only be able to work at a kindergarten placement. If you have qualifications or experience in this field then we can make use of your skills volunteering abroad as a professional in Fiji. If you are a high school student and first-time traveller you may want to consider our High School Special programs in Fiji. While you’re in Fiji, you might also consider joining a 1 week Culture & Community Project. For more information, please visit our Community Village Project in Fiji page. Our Combinations Page explains how you can combine not only projects, but also destinations.